FROM COOKING TO CODING: KID’S CODE @ CAMP! Montreal, QC – January 3, 2018 – Laurus Lifestyles, announces today that they will be introducing a Kids Computer Coding program at their March Break and Summer Camps in 2018. 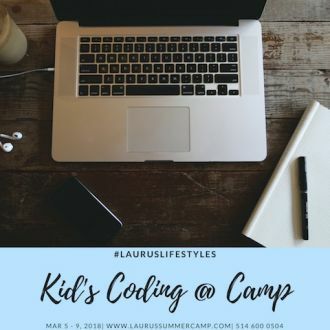 From March 5th to March 9th at Laurus March Break Camp, they will offer a 75 minute daily coding class to Laurus campers. Laurus’ Kid’s Coding class will teach the basics of computer coding through working on different units that build on each other with the goal of creating their own custom app. “An increasing number of kids and young adults are moving away from blindly accepting the technology in front of them and becoming more fascinated and curious with how it works” said Ava Nouraeyan, Director of Laurus Lifestyles. When Laurus first opened in 2012 there was a big push in the Montreal and parenting community to engage kids in understanding food; how to cook, what is in it, how to eat healthy, and so on. In addition to the continued desire to engage kids in cooking classes, there is now a push to engage kids in a deeper understanding with the technology in front of them.